When memory care residents and high school students are brought together, the positive impact is almost always far greater than either group anticipates! That is why inter-generational gatherings and events are a regular occurrence at Chelsea Place Memory Care in Aurora, Colorado. They provide frequent socialization for the residents, who enjoy meeting and interacting with young people. 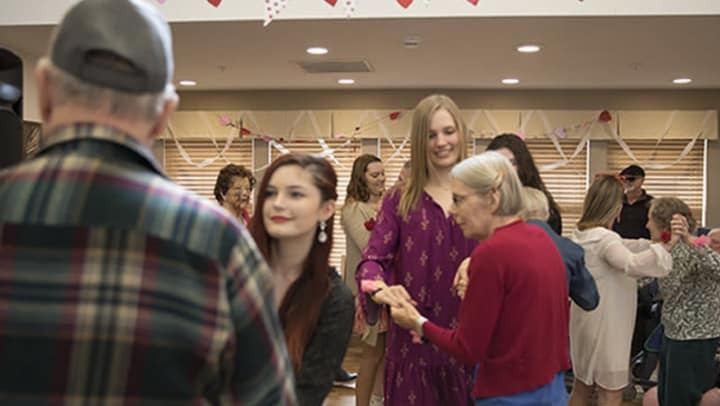 Most recently, Chelsea Memory Care held a Valentine’s dance, inviting high school seniors from local Regis Jesuit High School to help plan and attend the event. Age barriers quickly came down, as students and residents got to know each other. As is often the case with young people who have little experience with seniors, some of the students were nervous and a bit wary of the project. A few did not have grandparents or older family members and, therefore, had never had any meaningful interactions to guide them. As it turned out, however, they didn’t need them. The excitement of planning the event pushed aside any barriers as young and old joined together to put on a fun and relaxing event. As with other events at Chelsea Memory Care, local news outlets heard of the upcoming Valentine’s dance and joined in the festivities, bringing along camera crews and reporters from local news channel, KCNC, The Denver Post and The Aurora Sentinel. For one student it was a “connection of souls”. Brining generations together has a positive effect on the residents and the young people. Jenni Dill, Life Engagement Counselor for Chelsea Place, witnesses these joyful moments often. That’s why Chelsea Place, as well as all the other Anthem Memory Care communities, work to bring those from the greater community in to meet and engage with their residents on a regular basis. As you can imagine, the dance itself was a resounding success. And for those, like Kali Soudani, it was also a life changer.